D&S Manufacturing, a metal fabrication and manufacturing facility in Black River Falls, WI, is faced with the strains of a growing business. Since its founding in 1965, the company has supplied parts and assemblies for numerous OEM clients in the agricultural and construction industries. Known for producing large, heavy weldments in small quantities, D&S has 150 employees with more than 35 welders working two shifts. Not content to maintain the status quo, company management knew it could not grow the business and increase productivity without finding solutions to two major challenges. First, it had to increase productivity without hiring additional personnel, since finding skilled welders has become increasingly difficult. Second, while welding automation seemed to be the logical solution, the current programming method for the company’s robotic-welding cell—using a joystick to manually lead the robot through its welding path and recording all of its stops and starts along the —meant that the cell was being used more for programming than for production. It was clear that to expand production of large parts in such small quantities without more manpower, D&S needed a robotic-welding cell with offline programming. A servo-controlled arc-welding robot and three-axis positioner form the heart of a new welding cell at D&S Manufacturing. Offline-programming software frees up the cell for production instead of programming and has improved accuracy. Armed with a number of sample parts and CAD drawings, Joe Lane, manufacturing engineer and acquisition team leader for the welding-automation project at D&S, in 2006 contacted several robotic-welding companies. While all of the firms had comparable welding systems to perform actual welding, part programming was a challenge. Several offered offline software programs, but not all were capable of executing the same program on both the computer and the robot station. RobotStudio software from Rimrock-Wolf Robotics (Fort Collins, CO) was the most accurate,” says Lane, explaining the company’s decision. To get the system running as quickly as possible, D&S contracted Rimrock-Wolf Robotics to create a virtual test cell identical to the one it would build for D&S, and calibrate it to improve the accuracy of downloaded programs. Wolf Robotics engineers created the cell and programmed the initial parts for D&S. “When we downloaded the program to the robot, it was off by less than 5 mm.,” explains Lane. 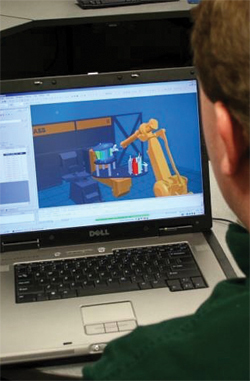 Rimrock-Wolf Robotics officials attribute RobotStudio’s accuracy to a virtual controller that runs the same software as that contained in the robot controller on the production floor. The offline-programming software also includes ArcWeld, a dedicated programming tool for generating arc-weld programs. Unlike traditional online robot programming performed directly on the robot, ArcWeld and RobotStudio utilize CAD geometry as the basis for all robotics programming. To create a weld, the user picks the start and end point of the weld and defines process parameters. ArcWeld automatically generates the weld path based on this input and creates approach and depart paths that will move the robot in and out of the weld location. Before downloading the final program to the real robot, the user can debug it by executing the entire program in RobotStudio. A built-in Collision Detector feature indicates any interference between the robot and the part, and provides a cycle-time estimate to help the user balance production. A technician uses software to perform final debugging on a weld-path program prior to downloading it to a robotic arc-welding cell. welding scenario to achieve proper penetration and weld strength. In addition, the tooling system’s design-verification capability ensures that the robot has proper access to each weldment without interference from clamps and other components. 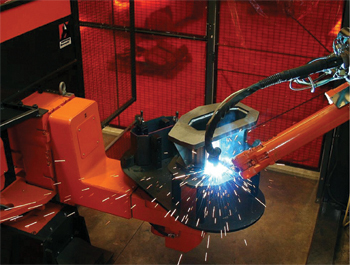 Along with the software, D&S Manufacturing purchased a complete robotic welding cell from Rimrock-Wolf Robotics, a LeanArc 500B, with components and capabilities key to the installation’s success. For example, the cell features an ABB IRB 2400L robot with expanded reach capability; a servo-controlled, three-axis indexing IRBP 500B positioner that can rotate the weldment around its own axis and handle to 1100 lb. ; a Wolf Cell Control that provides the operator with complete cell control from one location; and Advanced Weld Control seam tracking. The robotic-welding cell at D&S operates two shifts per day, with one operator on each shift. The operator can load parts on one side of the cell while the robot welds on the other. Jobs that previous took 2 hr. to perform manually are now completed in 35 to 40 min. “Our goal was to cut welding time in half and we have exceeded that projection,” Lane says. He recently has completed first programming of a part with more than 50 paths and believes it has saved “more than a week of work” versus the old process of manually teaching the robot its paths. Besides employing the offline programming software for more new projects, Lane is training a technician to use it and download to the machine as the need arises. The next step, Lane says, is to install a second system similar to the first and keep them both busy with offline part programming. Information for this article provided by Rimrock-Wolf Robotics, Fort Collins, CO. Tel. 970/225-7600; www.rimrockcorp.com.